Arsenic is an abundant, naturally occurring element that can be found at varying concentrations in the Earth’s outer crust around the world; it is more concentrated in areas where there are copper and lead ores. Possessing properties of both a metal and a nonmetal, arsenic is classified chemically as a metalloid but we usually just call it a metal. Elemental arsenic is a silver/gray solid, but it is rarely found like that in nature; it tends to combine with active elements like sulfur, chlorine and oxygen. Arsenic combined with these elements is called inorganic arsenic. When arsenic combines with carbon or organic ligands, it’s referred to as organic arsenic. Inorganic arsenic compounds (such as those found in water) are highly toxic, while organic arsenic compounds (such as the arsenobetaine found in seafood) are generally less harmful to health. It is important to understand that arsenic cannot be destroyed in the environment. It can only change its form. Most inorganic and organic arsenic compounds are white or colorless powders that do not evaporate, but can be attached to tiny particles that will inevitably become airborne. When airborne particles are tiny enough, they can stay suspended by air currents for days and travel many thousands of miles from their original point of origin. These particles will eventually hit the ground courtesy of gravity or precipitation (rain, snow etc.). Many common arsenic compounds can easily dissolve in water, so arsenic can get into lakes and rivers, and is certainly not only found in groundwater. We are exposed to arsenic compounds every single day through fruit juices, vegetables, rice and grains, dust in the air or even by contact with pressure-treated lumber. They usually have no smell and most have no unique taste; one usually cannot tell if an arsenic compound is lurking in food, water or air. Currently, the primary, recognized cause of unintentional arsenic consumption is from drinking groundwater that contains arsenic. Surveys of US drinking water indicate that about 80 percent of water supplies have less than 2 ppb of arsenic, but two percent of supplies exceeds 20 ppb. 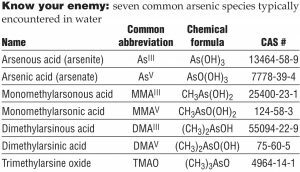 Both inorganic and organic arsenic compounds are metabolized by the human body to varying degrees and some will be excreted in urine. Most organic arsenic is expelled and a large amount of inorganic will leave the body after a few weeks, but some of that arsenic will remain indefinitely. An elevated level of arsenic is believed to interfere with cellular metabolism. Arsenic poisoning produces gastroenteritis, esophageal pain, vomiting and violent diarrhea. Eventually the skin becomes cold and clammy, blood pressure drops and overall body weakness sets in. Death from circulatory failure is sweet release from the convulsions. Large doses of arsenic insufficient to kill will cause restlessness, nausea, vomiting, headaches, dizziness, chills, cramps, irritability and variable levels of paralysis and neuropathy that may progress over several weeks. Even at extremely low levels, arsenic consumption has recently been linked to the development of diabetes, oxidative stress, DNA damage, skin damage and immune-system malfunction in susceptible persons. The Department of Health and Human Services (DHHS), the International Agency for Research on Cancer (IARC) and US EPA have classified arsenic as a human carcinogen. Chronic exposure to even low arsenic levels (less than 0.05 mg/L) has been linked to health complications, including cancer of the skin, kidney, lungs and bladder, as well as other diseases of the skin, neurological and cardiovascular system. Skin absorption of arsenic is negligible; therefore, hand washing and bathing do not currently pose a known risk to human or animal health. Water exposed to oxygen will generally contain arsenic in the pentavalent +5 (oxidized) state, whereas hypoxic waters (low or no dissolved oxygen) will contain arsenic in the trivalent +3 (reduced) state. Both are quite toxic; the trivalent is more easily assimilated by humans, making it even more dangerous. Don’t be fooled into believing that only groundwater contains pentavalent arsenic. Some species of bacteria derive energy by oxidizing various materials while reducing arsenates to form arsenites, using enzymes known as arsenate reductases. There are also species of photosynthetic bacteria that can oxidize arsenites into arsenates; remember to speciate whenever practical before attempting a treatment solution. The path toward truly reducing arsenic content in drinking water has been slow and tortuous, since it is found in so many places, as well as the significant expense involved in treating it at a municipal level. The first national allowable arsenic level in the US was 0.05 mg/L, as established under the 1975 National Interim Primary Drinking Water Regulations (NIPDWRs). 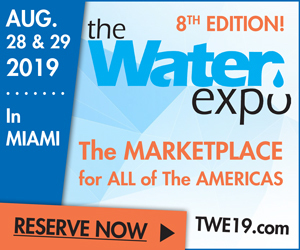 As part of the 1996 Safe Drinking Water Act (SDWA) Amendments, US EPA was directed to conduct health effects and cost-versus-benefit research to determine a new arsenic standard. In June 2000, the agency proposed a revised arsenic maximum contaminant level (MCL) of 0.005 mg/L and requested public comment on alternative MCLs of 0.003, 0.010 and 0.020 mg/L. 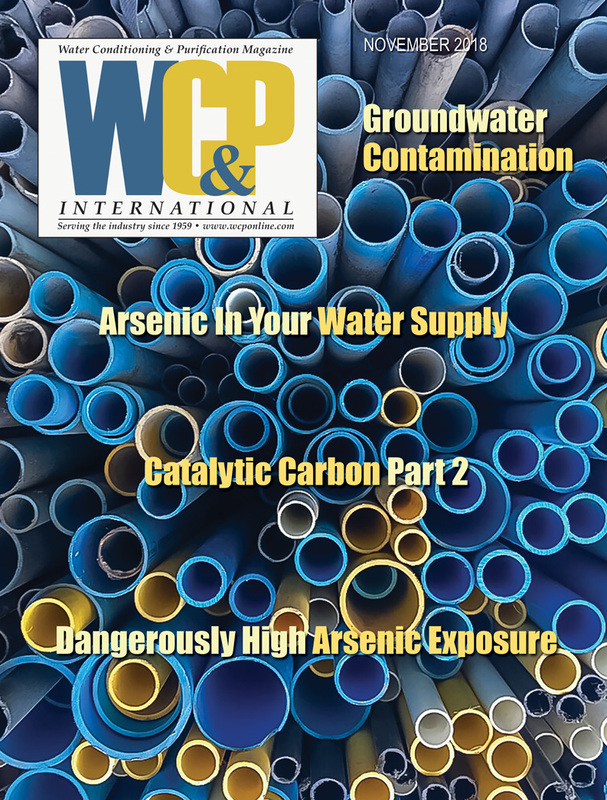 US EPA published a final rule in the Federal Register in January 2001 (US EPA, 2001), establishing the MCL of arsenic in drinking water at 10 ppb (0.010 mg/L). 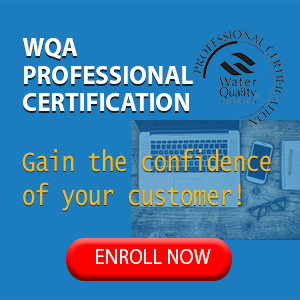 This rule is enforced at over 60,000 community water systems in the US and adherence to the rule is required by most counties for a home to be occupied that is being served by a private water source. According to the USGS, arsenic concentrations exceeding 10 µg/L appear to be far more frequently observed in the western US (including Alaska) than in the east. It is my position that the MCL for arsenic doesn’t represent a safe consumption level but rather a level at which the risk to human health and safety is reduced and economically achievable by municipal water providers. Since arsenic is consumed from so many other sources, one should strive to reduce drinking water arsenic level to zero. The first rule when attempting to address arsenic contamination is to know and understand your limitations. If you’ve never done this before, don’t rush in and wing it. At the least, you’ll embarrass yourself and at the worst, endanger the health and safety of your customer. Consult with industry experts and equipment supplier(s) to ensure that you always protect your customer and put their needs first. Whenever you are tasked with an arsenic reduction project, test the source water using a reputable laboratory whose data will be accepted by your local regulating agency. Test for the following at a minimum: total arsenic (speciation is preferred), pH, total alkalinity, phosphate, silica, vanadium, selenium, molybdenum, iron and manganese. If there is hydrogen sulfide (rotten-egg odor), then be sure to quantify this for the total oxidative demand calculations. • All moving parts should be protected by a 100-micron filter at minimum. • Arsenic V is easier to address than arsenic III, so the smart decision is to oxidize properly before you do anything else. Various oxidation techniques can be used, such as bulk aeration, ozonation, chlorination, permanganate addition, as well as exposure to an oxidative media like manganese greensand. 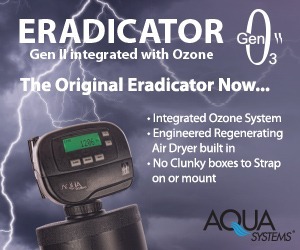 • Once oxidized into mostly arsenic V, adsorbants are currently the most cost-effective method for reducing arsenic in residential and small commercial systems. • Always deploy a dual-pass arsenic sorbent technique—plan for redundancy. • Anion exchange is an effective technique for dropping alkalinity and reduction of competing ions in the source water that can significantly prolong the service-life of sorbent media beds. • Sub-micron post-polishing can be a cost-effective technique. Whenever possible, pilot-test the proposed treatment approach or at the least, bench-test three times with a miniature mock-up to project the efficacy of your approach. It is so much cheaper and easier to make adjustments to your methodology at this point. Arsenic has always been with us and always will be. As more research data is developed, we are realizing that the only acceptable level of arsenic in drinking water is ZERO. With global climate-change, groundwater resources are strained and underground water dynamics are changing; we don’t have the same water that we used to and probably won’t ever have it again. You need to be prepared to address arsenic in places and at levels that you’ve never had to address before. (1) Flanagan, SV, Johnston RB and Zheng Y. Arsenic in tube well water in Bangladesh: health and economic impacts and implications for arsenic mitigation. 2012. Bull World Health Organization 90:839-846. (2) Quansah R, Armah FA, Essumang DK, Luginaah I, Clarke E, Marfoh K, et al. Association of arsenic with adverse pregnancy outcomes/infant mortality: a systematic review and meta-analysis. Environmental Health Perspectives. 2015;123(5):412-21. (4) Vigo, J. B. and J. T. Ellzey. 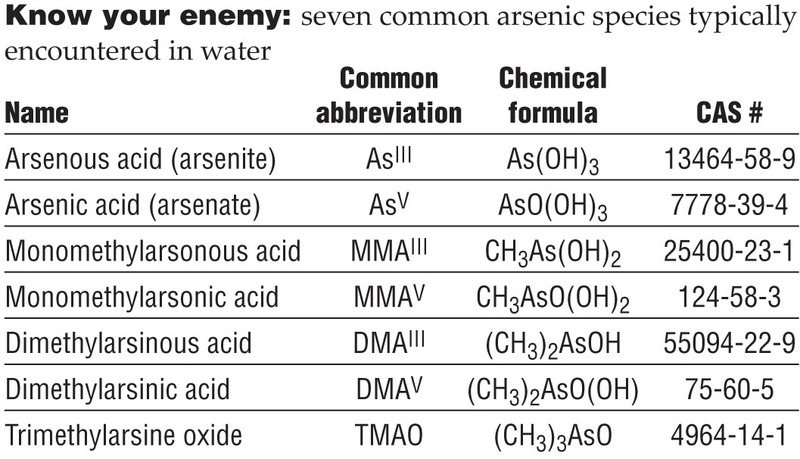 Effects of Arsenic Toxicity at the Cellular Level: A Review. (2006). Texas Journal of Microscopy. 37 (2): 45–49.